In Canada between 1885 and 1923, all Chinese immigrants were required to pay a fee known as the “Chinese Head Tax”. The head tax began as a $50 fee, but later increased to $100 and had to be paid by all Chinese if they were to live in Canada. In Newfoundland it was $300 and in force until 1949. Between 1923 and 1947, the Canadian government created the Exclusion Act, which prohibited immigration to Canada. In 1947 the Canadian government repealed these restrictions as they contravened the United Nations’ Universal Declaration of Human Rights. In Newfoundland, the Head Tax continued in force until Confederation with Canada in 1949. 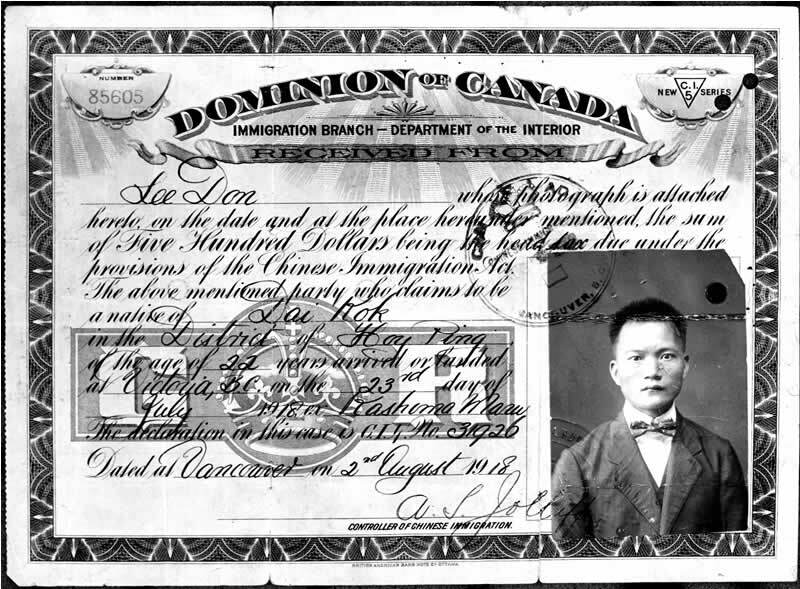 After decades of separation the Chinese were allowed to bring their family members to Canada. The acceptance of foreign immigrants began a positive transformation for Canada, and the Chinese communities across the country began to grow and prosper. This was a triumph for the Chinese, but the victims of this racist immigration legislation and their families still sought redress. In 1984, the Chinese Canadian National Council, representing more than 4,000 victims, began a formal campaign seeking an apology and financial compensation from the Federal Government. CCNC held several community meetings, provided awareness through the media, and spoke to several Multiculturalism Ministers. While all this took place the Chinese community was loosing survivors of the head tax. In 1993, former Prime Minister Mulroney tried to settle the issue by offering survivor medallions, and a permanent museum exhibition, but no apology or financial redress. The Chinese community rejected the offer. In December of 1994, the Minister of Multiculturalism announced that the government would not be providing redress for the head tax. This was seen as a severe setback for the Chinese community, but they continued to raise the issue whenever they could. It would be a decade before any significant progress would be made. In 2010, a monument commemorating those Newfoundlanders who were forced to pay the head tax was erected opposite City Hall in downtown St John’s. The Head Tax payers of Canada are true pioneers and deserve redress for the Chinese community, which would recognize their years of contribution to the country. (1) Chinese Canadian National Council 1947-2007: Marking 60 Years Since Repeal of Chinese Exclusion Act: Head Tax Redress Campaign. Web. (2) Newfoundland Head Tax Organization, Inc: “The Chinese Head Tax.” Web. 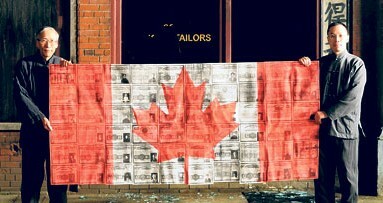 Please make a note in your article that I am the artist that created the head tax flag. Thank you!